What makes Dropps® laundry detergents different? 100% Clean. 0% Middleman. 2017 EPA Safer Choice Partner of the Year. Dropps ship free, right from the factory to your door. That keeps costs down for everyone. Paying less and saving errands? Yes, please! One pre-measured pac per wash load is all you need. Dropps are right for all machines (HE/high efficiency and standard), fabrics, temperatures, colors, and septic tanks -- you’ll get it right every time. 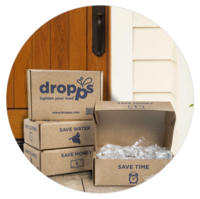 Dropps ship to your door in a 100% recyclable cardboard box, and our pre-measured pacs dissolve right in the wash. Way less plastic, space, and waste. We measure up to some tough standards to bring you peace of mind and to do our part for the planet. Meet the Disruptor: Dropps, Philadelphia Citizen, June 8, 2017. This page was last edited on 18 December 2018, at 11:55.